300+ miles over 5 months of training runs, dedicating time 4-5 days a week to running, long runs that get longer every week, adjusting your diet, testing race nutrition, testing kit, hydrating, running hills, speed training, adjusting your pace, driving routes to make water drops the night before a long run, muscle cramps, tightness, niggles, injuries, foam rolling and sports massages. I can’t do this! I can’t even run a 2 hour half marathon! I’m too slow! I’m not even a real runner! I can’t do it! Why am I struggling on a 4 mile run when I managed 15 miles just 2 days ago? I’m at the back of the group again! I’m done in! The injured runners are passing me! I can’t do it! The older people are faster than me! I can’t do this! I can’t look at that 20 miles on my programme it scares me! 26.2 miles is a really long way! Why did I sign up for this! I’ve missed a training run I’m never going to do it! I’m too tired to run today! …and overcoming it when you run 20 miles with energy left in you to continue and your head is finally screaming YES, YES, YES YOU CAN DO IT! The marathon is watching your body change.. I have lost some upper body strength, the definition in my arms gone and my abs are hidden under a layer of fat, my tummy is more round thanks to ALL the carbs and from me being extremely nieve thinking I could eat everything in sight because I’d be running it off later. My thighs are bigger, my legs are stronger. I have ugly dead skin on my feet from blisters on blisters, all ten have survived but my toenails are cut to a millimetre of life, I have marks from chafing in VERY delicate areas, there’s a white band on my wrist where my Garmin sits. My face has taken a beaten from the ever changing weather and I have aches and pains to rival my 90 year old neighbour. …but loving it more than you ever have because you’ve watched it do amazing things week after week. It’s true in Scotland we see all four seasons in a day whatever the season but training from November to May means running in the dark, in snow, on ice, against head wind, tail wind and blow you of the kerb wind, rain in all directions and most recently the sunshine. You’ll have suffered overdressing and stripping layers mid run or under dressing and coming home blue and shivering. ….I think our finishers T-shirts should read I TRAINED THROUGH STORM DORIS. The marathon is dealing with the pains and niggles.. I was no exception to this, I didn’t lose toenails, suffer shin splints or even migraines like some of my run buddies did but I had my fair share of pains. There was an issue with my foot that I feared was a metatarsal stress fracture which randomly disappeared. Followed by trouble with the IT band at my left knee, I’ve had it before but never as painful as I felt on the last mile of our 17 mile long run thanks to an almighty steep decline from the Ochil Hills. I could barely walk that last mile and it threw me out for my 18 mile run. I thought then it was game over for me. I was already slow but to miss a week or so of training so near the end would definitely ruin my marathon. …and realising that you are pushing your body further than you ever have of course it’s going to complain. The dodgy knee/IT band did not mean I was out but I do have to run slower than I would have liked this means any time goal I had was quite simply disregarded and my goal became crossing the finish line. I found this hard to accept as my running group are still all aiming for the same time goal we set at the beginning of training. The weather, well we can barely even predict the weather here and unfortunately it can have a huge impact on how your race goes. I’ve had to abandon many a training run because I’m soaked to the skin or it wasn’t sunny when I left but now my shoulders are burning. It’s a case of dealing with what elements are thrown at you on the day. Some runs are good and some runs are bad, I myself am pretty inconsistent and can’t ever pinpoint what causes a bad run, unfortunately sometimes even race day just isn’t a good run day. …you’ve just got to go with the flow. I know a lot of good runners who are not running the marathon, some of whom are judging people that are running the marathon… For being bucket listers and not real runners, questioning why we would bother to do it if we know we won’t get a good time, not training sufficiently blah, blah, blah. I’m a bucket lister because I’ve learned through training that this distance is probably not for me. For this race I’m also a charity runner. I won’t get what a runner considers a ‘good time’ and I’m ok with that. I’m running in a race but I’m not racing there’s a difference. I compete with myself and no-one else. I run with a group of girls who can all run faster than I can and I wish them nothing but the best and can’t wait to see how well they do and I know they all wish the same for me. …26.2 miles is an achievement regardless of how long it takes. Good Luck if you are running this weekend. 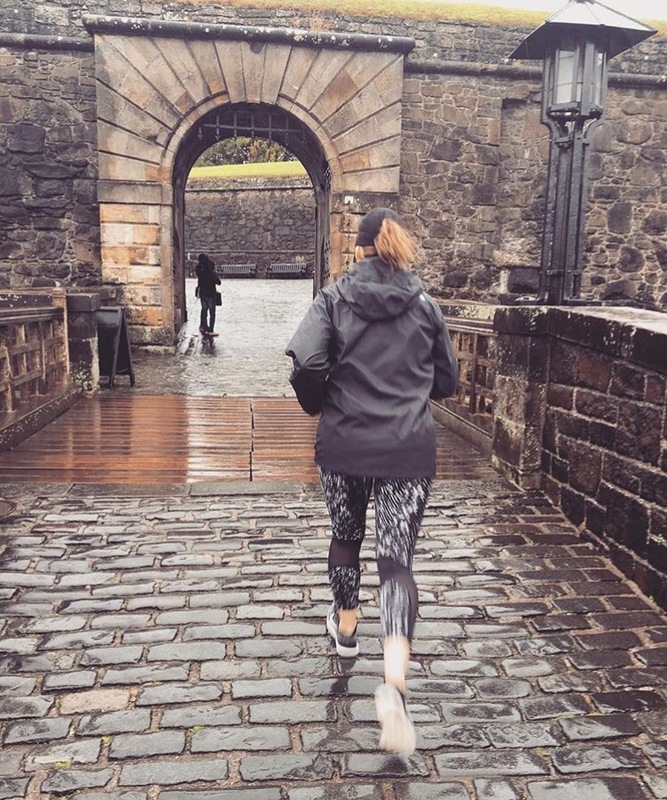 I have scheduled this post to publish as I cross the start line (…except I actually forgot to publish it…) So you can read it while I’m pounding the tarmac around Stirlingshire with Liz McGolgan and Zola Budd…well they’ll be pretty far in front of me, ha! A. Sub 4hrs 30 minutes 😂 the knee claimed that one. A(2) Cross the finish line, hopefully sub 5hr but not putting pressure on myself. B. Do not die, poo or pee myself. C. Enjoy the atmosphere, maybe take a selfie or two. D. Smile for race photos and not be ugly crying in my finishers photo. Previous Post Past Adventures • What happened in Vegas? Thank You Margaret! You too, I hope like me, you aren’t taking that medal off for at least a month, ha! It was such a great day to be part of!! Well Done, you done amazing! Can’t wait to read about the day! Congrats on all that training, and on race day 😍. I can’t imagine training for a marathon through winter than again I stupidly trained for one through a CA summer. 😛 I hope your race went well! Looking forward to the recap! I can’t imagine training in heat, I get too hot running even when it’s cold outside!!! Recap coming soon…while I remember it! I Can’t wait to read about the marathon now! Congrats on finishing! I don’t think I’d even care to run that far, haha. I love this post though. It really does seem so accurate. SO much training goes into such long runs! I’m still so impressed by your dedication because I probably would have decided halfway through training not to run it! I think it’s awesome that you stuck with it. Thanks! I don’t think I’ve ever stuck at anything for as long in my life, ha, but I knew I wouldn’t manage without the training behind me. I can’t wait to hear your thoughts on ICELAND, not long now! Congratulations! How did you find it? I ended up walking (with a few runs) 17 miles as I cheered on my girls also ran beside them to establish if they needed anything. Cheered on so many people, hope you were one of them! I seemed to follow the same crowd around all day. I was wearing a bright orange running shift with purple jacket on top haha! You are a star. The crowds were absolutely brilliant, they helped me so much towards the end and the weather was not fun for spectators. Were you running alongside someone in Riverside(the loop), I remember someone (wearing purple) running beside a girl near me asking if she was OK or needed anything? I only remember because I though that was awesome! I love this. How did you do? I don’t mean time-wise – that’s a silly question. I learnt today and yesterday that, although most people ask about the time they only really do so because that’s all they understand. Some colleagues who are much stronger runners than me are still dang impressed: 26.2 miles is still 26.2 miles. I hope it all went well Angela and that you did not die, poo, or pee yourself haha. <- I've always wanted to say those words in a comment. Paul, I just remembered I was commenting on your post when my computer crashed, will go back and finish what I started! I can confirm I didn’t die….or poo or pee haha! Thanks Mai 😊 I’m trying to write a race report but forgetting so much of the day already haha! I planned to but I didn’t haha! That’s great! How long until your marathon? Awesome! You’ll do great, can’t wait to read about it! This is a great post! And so very relatable. Congrats on your marathon, it’s a huge achievement. Great post! I’m early in my training for my first marathon and am already sidelines with a strained IT band. It can only get better from here! Thanks for the inspiration!